From the moment Sputnik 1 was catapulted into space, a layer of debris has been slowly accumulating on low Earth orbit. Millions of fragments from past missions, retired satellites and military tests are flying at speeds of up to 30,000 km/hr above our heads. These range from the size of a sand particle up to the size of car. This layer of junk is a floating time bomb. A small fragment could collide with a larger structure breaking it into many small fragments which then have the potential to destroy other satellites. In the worst-case scenario, the chain reaction could lead to an uninhabitable environment for space technology and potentially imprison us on Earth for centuries. This problem could affect everybody currently on Earth as well as future generations for centuries to come. Is it possible to balance the needs of our daily lives with the protection of a sustainable space environment? Space debris is rapidly approaching a critical level. Should space missions be halted? The World’s population depends on satellites for enabling phone calls, GPS, television, weather forecasts, large scale farming, asteroid tracking and space discoveries. With a growing population and as developing economies modernise, it is essential for the space-infrastructure capacity to increase with demand. Without continued maintenance, support and new systems our modern world could grind to an abrupt halt. Consider the devastating effect the loss of weather satellites could have on the population. Our ability to predict both the formation and path of hurricanes allows countless lives to be saved each year by providing an opportunity for people to evacuate from danger zones. Scientific discoveries would also be severely hindered if space telescopes were not in service, they have allowed us to understand the age of the universe, monitor climate change, witness the birth and death of stars and further the understanding of the human race in ways previously unimagined. Additionally, experiments in space are necessary since a sustainable zero-gravity environment is impossible to simulate on Earth. In 2016, the United Nations released a resolution declaring internet access to be a human right for prospering in the 21st century . Due to the high costs of setting up and maintaining cable broadband, especially for large areas, satellite internet is an attractive option. Companies such as SpaceX and Samsung already have plans to implement such technology . Surely it is wrong to deny those in developing countries the access to affordable internet, something that forms such a vital part of life in the developed world. Although the maintenance and operation of current infrastructure is crucial, the space-debris problem is rapidly approaching a critical level. It is estimated that the amount of junk in orbit is expected to grow tenfold in the next decade if current trends continue . 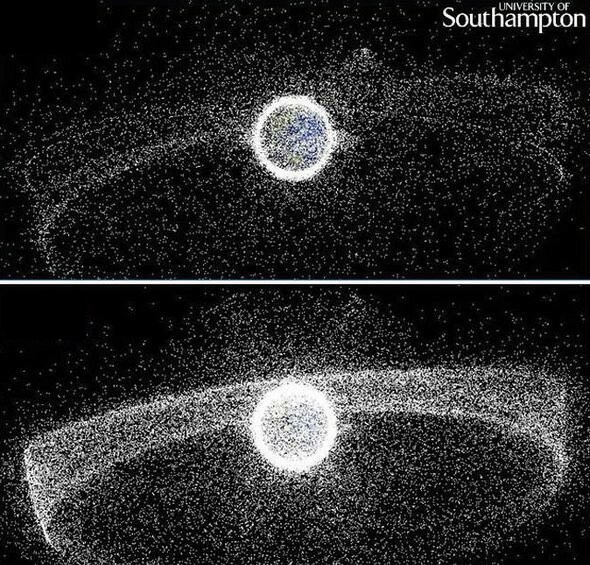 Space junk has the potential to cause catastrophic damage to orbiting infrastructure and could put an end to the idea of ever colonising other planets. With Earth surrounded by a cloud of rapidly moving fragments, best illustrated in Figure 1, it would be far too dangerous to attempt to launch a spacecraft. Therefore, it is essential that the problem is tackled before a disastrous chain reaction occurs. In order to achieve this, the number of experiments taking place in space and the number of satellites being launched must be reduced until the situation becomes clearer or a solution presents itself. In 2007, one Chinese anti-satellite military test is estimated to have increased the amount of space debris by 25% . Such tests and experiments should not be allowed to continue given that they knowingly create more space junk. It would be unreasonable to cease all new development in space, what is needed is the introduction of legislation and the requirement that any new satellite or rocket launch would have to show a high-level of tangible benefit. We must consider future generations, it is deeply unethical to continue activity that we know will trap the human race on Earth before we even have the ability to leave. Therefore, it is imperative that the number of objects being sent into orbit is vastly reduced before the ‘space highway’ to other planets becomes irreversibly blocked. Is active debris-removal technology enough to tackle the problem? The expansion and development of new space infrastructure can be justified since technologies are becoming available to help reduce the amount of debris in orbit. One of the major areas of development is in harpoon or net technology which has the aim of capturing the larger pieces of space junk and bringing them back to atmosphere where they burn up. This technique has already been tested in space by the RemoveDebris project and progress is promising. Another potential solution is using electromagnets to ‘push’ the debris into a safer orbit. The final field of technology being seen as a possible solution is lasers or plasma ‘guns’ which melt the debris to change its mass, guiding it into a safer orbit or destroying it entirely. These technologies, provided enough investment, will allow us to continue using space infrastructure whilst also creating a sustainable space environment. Unfortunately, most of the technology proposed is unproven for large scale use and despite working in concept, could actually add to the crisis. As debris is travelling at over 8 km/s, it would be extremely difficult to consistently capture fragments with a net. Moreover, if the device collides with other junk it could actually break up and become debris itself. Electromagnetic devices are also unreliable because they cannot target objects exclusively, the magnetic field will influence everything around the device. Therefore, to alter the debris orbit, there cannot be other space instruments around the device, constraining the window within which this task can take place. Laser and plasma guns may only succeed in breaking off parts of the debris instead of melting them, creating additional fragments. Also, due to the inhomogeneous nature of the junk, it is unlikely that laser and plasma guns will be able to burn off the required amount of material to change the debris’ orbit safely. Therefore, the proposed technologies cannot be trusted to solve the space debris problem on their own. It would also be extremely unfair to place the burden of solving this worldwide issue solely on those developing the technology. Reduce the number of launches until problem is better understood and solutions are proposed. 1. Szoszkiewicz, Lukas. 2018. “Is The Right To Access The Internet A New Human Right?”. Sravnitel’noe Konstitucionnoe Obozrenie 119 (4). doi:10.21128/1812-7126-2017-4-109-123. 3. David, Leonard. 2019. “Ugly Truth Of Space Junk: Orbital Debris Problem To Triple By 2030”. Space.Com. https://www.space.com/11607-space-junk-rising-orbital-debris-levels-2030.html. A unique and fascinating topic. You need to expand the ethical arguments and refine your question though. What is your core issue? Is it do we limit satellite launches? Or is how do we clear up space junk? This was a thoroughly engaging article on an interesting topic. I had no idea of the magnitude of space debris and it’s effects. I agree with the initial decision of halting space launches, the consequences of building up this debris would be too catastrophic if ignored for too long – despite the problems that halting launches could have. However the technology problem could be an issue in the face of this. I agree that this is an important issue, so any space launches with the risk of adding to the space debris issue should be carefully considered – as mentioned in the article, it would be unethical towards developing nations to outright ban any launches until a solution to the problem becomes clear. However, launches should certainly be minimized until the developed countries who have caused the issue have found their solution.